The Catitude set of stamps came out and just screamed to me to do them in natural colors like the dogs….while they’re not a comparable set,exactly (I’d love to have cats the same size as the dog stamps. Hey, MFT…… 🙂 …..they still have catitude, and they’re out sitting by a fence! Just in watercolor pencil this time. My first attempt with my new Albrecht Durer set. Watch the video below, or click HERE to see it in HD on YouTube! And MFT just came out with a new release, which includes the adorable Sunny Skies and Stitched Cloud Edge dies. Can you just see how much we can use these in backgrounds? Fun! Another creation with this stamp set – I was inspired to make an art journal page while I had the stamps out. I added the kitties and the center sentiment from the set, watercolored the background, drew it all with sharpie – then did watercolor pencil inside all the images I drew! I’m off to CHA – see you guys from there soon! I’ll be on periscope and posting vlogs as I’m able. 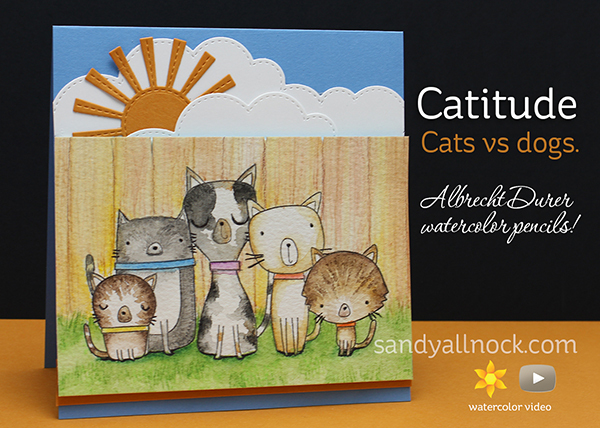 Cute card and great watercolor tips. I am a dog and a cat person. Am a dog/cat person. Loved both you cards of the animals. Am always looking forward to your videos. Thanks for always encouraging us. Cute card! I am a dog person. Loved your inside outside dog card you did and this cat card is really nice too. I love this card! I am animal person! We have e dogs, a cat, 2 ferrets, a bearded Dragon and a lot of fish!!!! I enjoyed this! Awesome watercolour and card! Cats rule! Thank you for the tutorial, I really enjoyed it and will try these technics sometime soon. I always thought I was a dog person, but after getting a cat 6 years ago as our house pet, I am no longer sure….I guess I love all sorts of critters. I wonder why MFT didn’t make the cats in the same scale as the dogs, tho – it seems an obvious thing to do, so we could mix them on a card – I can think of some pretty funny cards, if they were “together”! I’d be considered both plus a hedge hog.I love animals period, I have two cats and two dogs as well.Really love how easy the new site is Sandy.Its wonderful.I love the loads of info.The shading map is helping so much.Big thank you. are “caretakers” for about 10 feral cats who live in our neighborhood. I’m a dog person, but these guys really show the “catitude”! Love the card!! Love the journal page! Also love that I can now comment without opening your blog up in a different browser first. Oh my goodness! So cute!! No more dogs or cats. We lost our dog on Nov. 30th. He was 15. Beautiful card! I’m not a cat or dog person, I’m both! I have 2 dogs and 3 cats (because I’m crazy!). Dogs will always win, but the Cats are cute – in a non dog way too. Spoken by a dog lover! Have fun at CHA. P.S. I would really like you to do a Cruise and Crop. I would be the first person to sign up! have fun at the CHA!! I’ve had your original “inside-out” card on my to-do list for a while as I actually have that set. Maybe this will give me some incentive to give it a try. As always, thanks for a great video and for sharing your talents. Such an adorable cat card! I love the way you combined your painting with the background! Your new website is great too! Love the card but the journal page is a wonderful inspiration. I need to add more hand drawing to my cards. Have fun at CHA. Definitely a cat person! Love these kitties. I’m going to have to get me some. Thanks for the tips on watercolor pencils. I have been looking for some advice on them. Great jov! Oh this cat stamp looks fabulous! Love your journal page!! Love these MFT stamps and what you did with them, both cats and dogs! I’m enjoying your new website, and also the CHA periscopes. Thanks for everything! Love it! I really like your art journal page too. You continue to amaze me with the gifts that God has given you! Wonderful card. I am a dog person. Although, we have 1 dog, cat and kitten. Love your video! Personally I’m a dog person, but after watching you create a beautiful cute card, I will state I’m both a dog and cat person. Love both of your cards. Enjoy CHA.